President Jacob Zuma’s apology following the Constitutional Court judgment in the Nkandla matter has been accepted by his party, the ANC. This was the late Monday night outcome of the ANC national working committee (NWC) extended to anyone from the ANC top decision-making structure between conferences, the national executive committee (NEC). It could have been an ANC NEC meeting given that 80 committee’s members gathered at a Cape Town hotel on the eve of the DA motion to remove the president in Parliament. The meeting was the latest of a series since Friday as the governing party moves to mitigate the fall-out of the judgement amid calls for Zuma to step down from within and outside ANC in this local government election year. By MARIANNE MERTEN. A kilometre and a half from where Chief Justice Mogoeng Mogoeng chaired the Judicial Service Commission (JSC) interviews for would-be judges, the extended ANC national working committee (NWC) met to discuss elections and Thursday’s scathing Constitutional Court judgement. After an almost nine-and-a-half hour meeting at the President hotel, ANC secretary-general Gwede Mantashe said there had been “serious discussions”, and the meeting “has accepted the president has apologised – that is humility that is necessary for any leader”. Effectively this outcome means Zuma may have had to face some serious talk in the behind-closed-doors meeting, but he has remained unscathed as head of the ANC and as head of state. Tuesday’s parliamentary motion to remove the president is the next stop in the series of rapid-fire mitigation manoeuvres the ANC has conducted since Thursday’s Constitutional Court judgment, which found the president, and the national assembly, had violated the Constitution in the Nkandla security upgrades debacle. That is the message Mantashe will take to the parliamentary caucus he is meeting on Tuesday morning, around the same time opposition parties are meeting to discuss their stance. With the ANC numbers in the House, there is little, if any, likelihood DA leader Mmusi Maimane’s motion to remove Zuma from office will be successful. Once that is dusted, the ANC hits the road to “explain itself” to its structures. The governing party also will meet those who raised concerns from the uMkhonto we Sizwe (MK) commanders and commissars to Uncle Kathy, as Ahmed Kathrada is fondly known, who wrote to Zuma asking him to step down. In-house engagements is how the ANC prefers to do things. The message to ANC structures countrywide will be that the Constitutional Court brought finality to the Nkandla security upgrades matter. The order of the court for the president to personally repay a percentage of costs for non-security upgrades like the swimming pool, cattle kraal, chicken run, amphitheatre and visitors’ centre will be implemented. The book on that matter is now closed, said Mantashe. The extended ANC NWC meeting came as at least three ANC provinces pledged their support to Zuma since the weekend: the Eastern Cape and Free State executive committees issued statements; in various news reports North West premier Supra Mahumapelo also said so, as did KwaZulu-Natal ANC chairperson Sihle Zikalala. In contrast, according to EWN, Gauteng premier David Makhura said the ANC needed to listen to South Africans’ concerns during his address at the funeral of MK veteran Shirish Nanabhai. Also sitting well into the late night on Monday in Cape Town was the JSC. Interviews of judge candidates for the Bench were thrown somewhat off the initial schedule as Tuesday’s parliamentary motion required the attendance of a number of commissioners, including Economic Freedom Fighter (EFF) leader Julius Malema, IFP chief whip Narend Singh, DA MP Hendrick Schmidt, House chairperson Thoko Didiza and Justice Minister Michael Masutha. The minister found himself in an awkward spot – apparently he still had to write his speech for Tuesday’s parliamentary debate – after the JSC decided to sit through until whenever on Monday night to finish the Supreme Court of Appeal interviews. But plans were made and the JSC interviews proceeded late into the night. Unlike at the other, the commission’s meeting attracted significant less curiosity from the bemused groups of European tourists coming to Cape Town to escape the torrid weather back home. At the extended ANC NWC meeting there were phalanxes of bodyguards, an x-Ray machine and at least one police van marked “static protection: Parliament”. Monday’s extended ANC NWC meeting was the latest in an unfolding series of strategic moves in the wake of Thursday’s Constitutional Court judgement. On Friday there was a meeting of the ANC top six officials, including Zuma and ANC national chairperson Baleka Mbete, who is also National Assembly Speaker. 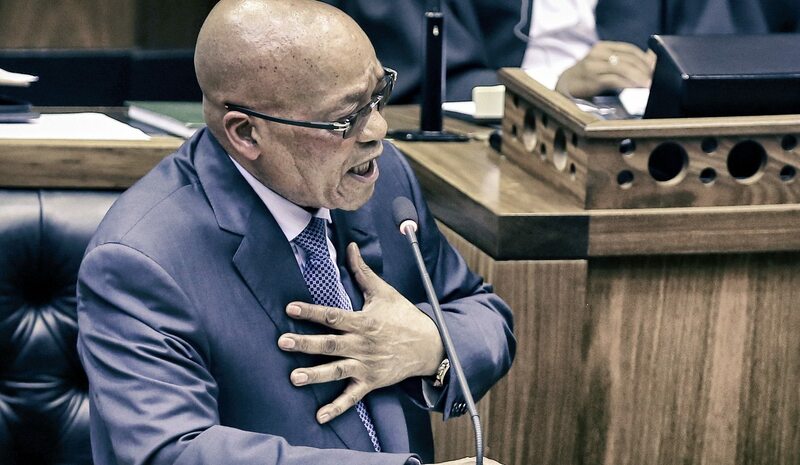 That evening Zuma addressed the nation, apologising for the confusion and frustration caused over the Nkandla matter. “I never knowingly or deliberately set out to violate the Constitution, which is the supreme law of the Republic,” he said. “While correct in law at the time the approach was subsequently demonstrated to be contrary to the Constitution.” Afterwards, the ANC said the other top officials had accepted the apology. On Saturday, Mbete announced she had agreed to the DA motion to remove the president from office as requested on Thursday, and that it would be debated on Tuesday. On Sunday, the Speaker and National Council of Provinces (NCOP) chairperson Thandi Modise selectively emphasised the Constitutional Court’s statement the national legislature could determine its own processes, over those parts of the judgement which stated the National Assembly had acted unlawfully by substituting its own findings. As for elections, it’s the third election governing party will fight under the cloud of the R215 million taxpayer-funded security upgrades at Zuma’s Nkandla rural homestead. The extended ANC NWC on Monday finalised its municipal poll manifesto, and will woe would-be voters from next weekend’s final registration weekend.